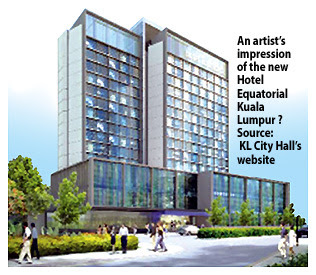 Kuala Lumpur: Hotel Equatorial Kuala Lumpur may be torn down under an extreme makeover, reflecting rising competition among hotels as Malaysia's tourism industry grows. It could also mean that the 38-year-old hotel will be the fourth structure along the busy Jalan Sultan Ismail to be earmarked for rebuilding. Malaysia wants to triple tourism receipts to RM168 billion in 2020 from last year's figure of RM56.5 billion by attracting 46 per cent more visitors. Hotel Equatorial will close from April 1 2012. It is understood that the hotel management had informed its staff a few weeks ago on its plans to temporarily cease operations from March 31 2012. "We are intending to do a major upgrading exercise that will involve the closure of the hotel," said its general manager Alan Ong. "The hotel was built and designed for the 1960s and today there is a need to upgrade. (In order) to stay relevant in the business, we have to do the upgrading," Ong said. Equatorial KL, which opened for business in 1973, was last renovated some eight years ago. The hotel has a room inventory of 275 and sits on a land covering close to 85,000 sq ft, which according to industry estimates is worth as much as RM250 million. Hotels have to regularly undergo renovation and refurbishment exercise in order to remain competitive in the market. Competition is expected to be stiff, with several new hotel openings and extensions announced in the Kuala Lumpur city centre including Grand Hyatt, Impiana KLCC and the Banyan Tree Signatures. Meanwhile, Ong was unable to say how long the hotel will be closed for upgrading works. According to sources, it could take up to three years before the hotel will be able to open for business, as there are plans to tear down the building. Messages left by Business Times at Equatorial KL's corporate office to obtain details on the project were left unreturned. Nevertheless, a search on the Internet revealed that the owners had submitted and obtained approval as early as last year from Kuala Lumpur City Hall for the proposed makeover. In February 2011, Business Times quoted Tradewinds Corp Bhd's chairman Tan Sri Megat Najmuddin Megat Khas as saying, "TCB plans to demolish both Komplex Antarabangsa and Crowne Plaza Mutiara Hotel to make way for a new property project". In September 2011, Kuala Lumpur mayor Tan Sri Ahmad Fuad Ismail said TCB had been granted a development order for Hotel Istana, which is located at the corner of Jalan Sultan Ismail and Jalan Raja Chulan. However, as at press time, it is still unclear when these buildings will be demolished. Hotel Equatorial's website states it is located in three major Asia Pacific countries with seven properties in the group. In Malaysia, the Equatorial hotels are in Penang, Cameron Highlands, Bangi and Malacca. The properties abroad are in Shanghai, China and Ho Chi Minh in Vietnam. Malaysian Resources Corporation Bhd plans to build affordable houses in one of its projects to serve the medium-income populace, its chief executive officer Datuk Mohamed Razeek Hussain said today. He said his property development and investment company supported the government's Projek Perumahan Rumah 1Malaysia as it was an excellent way to help the people who have not achieved the requisite income level to buy high-value properties. "Promoting Intelligence, Nurturing Talent, Advocating Responsibility" here today. On another note, Mohamed Razeek said the group had done the soft launch for its two blocks of condominiums at Kuala Lumpur Sentral. Known as "The Sentral Residences", the project received good public response. "We've almost sold all the units on the first block and when we opened the second block (for booking), it was a brisk sale," he added. PETALING JAYA: Bandar Raya Developments Bhd (BRDB) has yet to make a decision on the appointment of consultant for the sale of its prime assets but industry sources said companies such as Jones Lang Wootton Malaysia, DTZ and Knight Frank Malaysia could be eyeing the job. BRDB had on Sept 26 that it would hire an independent international property valuation firm to conduct a tender exercise for the sale of BR Property Holdings Sdn Bhd, which owns the successful Bangsar Shopping Centre and Menara BRDB as well as CapSquare Retail Centre and the Permas Jusco Mall. This came about after calls urging the company to do so after Ambang Sehati, BRDB's major shareholder with an 18.88% stake, had proposed to buy the prime assets for RM914mil. Ambang Sehati, the investment vehicle of BRDB chairman Datuk Moiz Jabir Mohamed Ali Moiz, would also be invited to participate in the tender exercise. BRDB has yet to reply to queries by StarBiz on further developments regarding the tender exercise. It is also unclear whether the property valuation firm would be appointed directly or after a RFP (request for proposal) to property consultancies. Sources told StarBiz that the decision might be made at the next BRDB board meeting, of which a date has not been fixed. Property consultancies contacted by StarBiz said they had not heard of any RFPs from BRDB or further developments regarding the tender exercise. “BRDB has been very quiet on this matter,” noted one consultant. SPNB to take over Oriental Village? GEORGE TOWN: Syarikat Prasarana Negara Bhd (SPNB) is in talks with the Langkawi Development Authority (Lada) to take over the operations of the Oriental Village in Teluk Burau on the resort island. Business Times has learnt that talks on the prospect began last year and a due diligence is ongoing. Sources said that by taking over the management of the Oriental Village from asset owner Lada, SPNB will be able to promote a greater value-add for its cable car operation, which is located within the Oriental Village compound. Panorama Langkawi Sdn Bhd (PLSB), a unit of SPNB, operates the cable car service that was introduced in 2003. Its base station is sited within the village. PLSB chief operating officer Eby Azly Abdullah when contacted, confirmed that the company is in talks with Lada. "We are talking to Lada on several options," he said, adding that one option could entail profit-sharing with the asset owner. 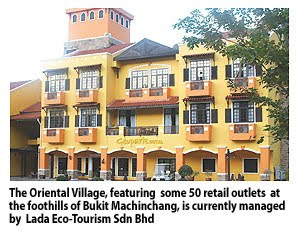 The Oriental Village, featuring some 50 retail outlets and located at the foothills of Bukit Machinchang, is one of several properties currently managed by Lada's wholly-owned Lada Eco-Tourism Sdn Bhd. The company also oversees the development and management of the Geopark Hotel Langkawi and Mutiara Burau Bay Resort in Teluk Burau. In recent times, the condition of the shops at Oriental Village has been a sorry sight for tourists visiting the area. Apart from having merchandise in most shops that mirror each other, the quality of the goods reportedly have been inferior. SEPANG: Retailers interested to be part of the new KLIA2, slated to be open end of 2012, can bid for space through two open tenders next month and February next year. Malaysia Airports Holdings Bhd (MAHB) senior general manager of commercial services Faizah Khairuddin said the tenders would be placed on MAHB website and major newpapers in early December and another one on February 15. The tender for next month will be open from December 5 to 9. "We will have the first batch in December and hope to get at least 20 to 30 per cent of the retailers then. The next one will be open in February after Chap Goh Meng celebrations," she said at a press conference after a preview on KLIA2 retail space here, yesterday. Faizah said KLIA2 will not automatically take in the retailers from the present low cost carrier terminal. "These retailers would also have to go through the open tender process like the rest," she said. According to her, the tendering process will be done in two batches because of the holidays in between, including New Year and Chinese New Year. The bidding process would take between four to six weeks. "May the best man win and in this case, companies that are outcome-driven would likely be given a chance," she said. Faizah said the whole tendering process would be completed next July, just in time for the airport's opening, scheduled by the end of next year. The overall retail space up for grabs at the KLIA2 is 225 outlets with a total of 35200 sq m space. One operator is allowed not more than five oulets. "Out of this space, 95 per cent would be for commercial purposes while the rest for upcoming small and medium enterprises," she said. On the commercial side, Faizah said 50 per cent would be for retail, 40 per cent for food and beverages, and the rest for services. Retailers interested to bid for the retail space at the new airport, can can go to www.malaysiaairports.com.my or www.klia2.com.my. IOI Corp Bhd’s subsidiary Sri Mayvin Plantation Sdn Bhd and Pertama Land & Development Sdn Bhd have mutually agreed to back out of a sale and purchase agreement that was earlier disputed. Pertama Land had, vide its letter dated October 25 2011, disputed Sri Mayvin’s termination of the SPA on October 25 2011. Sri Mayvin had initially agreed to buy 11.9ha of oil plantation land from Pertama Land for RM830 million. The former terminated the deal with Pertama Land, however, saying that it (Pertama Land) had failed to upkeep and maintain its properties, besides there being discrepancies relating to the properties. Sri Mayvin will be refunded the RM83million deposit it had put up.